How can I create a waveform image of an MP3 in Linux? Is there a package that can do what I need ? set obj 1 fillstyle solid 1.0 fillcolor rgbcolor "#222222"
Based on this answer to a similar question that is more general regarding file format but less general in regards to software used. 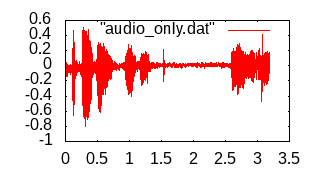 If you have a GUI environment you can use the audacity audio editor to load the mp3 and then use the print command to generate a pdf of the waveform. Then convert the pdf to png. use gnuplot to transform this list of value into a png graph. And voilà, the power of piping between unix tools. Now Step 2 in this list might be optionnal if gnuplot is able to read it's data from a binary format. "The spectrogram is rendered in a Portable Network Graphic (PNG) file, and shows time in the X-axis, frequency in the Y-axis, and audio signal magnitude in the Z-axis. Z-axis values are represented by the colour (or optionally the intensity) of the pixels in the X-Y plane. If the audio signal contains multiple channels then these are shown from top to bottom starting from channel 1 (which is the left channel for stereo audio)." You might want to consider audiowaveform from the BBC. audiowaveform is a C++ command-line application that generates waveform data from either MP3, WAV, or FLAC format audio files. 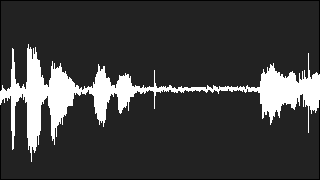 Waveform data can be used to produce a visual rendering of the audio, similar in appearance to audio editing applications. Waveform data files are saved in either binary format (.dat) or JSON (.json). Given an input waveform data file, audiowaveform can also render the audio waveform as a PNG image at a given time offset and zoom level. The waveform data is produced from an input stereo audio signal by first combining the left and right channels to produce a mono signal. The next stage is to compute the minimum and maximum sample values over groups of N input samples (where N is controlled by the --zoom command-line option), such that each N input samples produces one pair of minimum and maxmimum points in the output. Not the answer you're looking for? Browse other questions tagged linux audio mp3 packages or ask your own question. Can you find all classes in a package using reflection? How do I remove packages installed with Python's easy_install?